I am trying to run the test cases but they are not executing because of which i am not able to proceed in the curriculum. I tried reset and page refresh but it did not help. 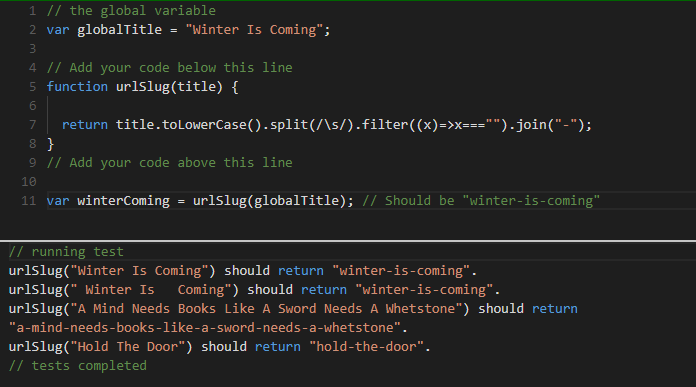 var winterComing = urlSlug(globalTitle); // Should be "winter-is-coming"
When I try your code the tests run and fail. Are you by any chance using Edge, IE, or Safari as your browser? Free Code Camp has been updated to use newer technologies. It makes the application much faster and it means that we can go much longer without having to do a huge migration like the recent one. However, Edge, Internet Explorer, and Safari are very bad about choosing not to adhere to standards and support new functionality in JS and CSS. Right now, that means that these browsers exhibit lots of unexpected behavior. If you become a web developer you will come to hate these browsers with every fiber of your being. I am using Chrome Version 68.0.3440.106 . Even if the tests are failing it should show failure message but it is getting hanged at running tests.